"The following puzzle has an added interest from the circumstance that a correct solution of it secured for a certain young Chinaman the hand of his charming bride. The wealthiest mandarin within a radius of a hundred miles of Peking was Hi-Chum-Chop, and his beautiful daughter, Peeky-Bo, had innumerable admirers. 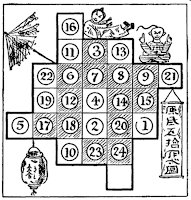 One of her most ardent lovers was Winky-Hi, and when he asked the old mandarin for his consent to their marriage, Hi-Chum-Chop presented him with the following puzzle and promised his consent if the youth brought him the correct answer within a week. Winky-Hi, following ahabit which obtains among certain solvers to this day, gave it to all his friends, and when he had compared their solutions he handed in the best one as his own. Luckily it was quite right. The mandarin thereupon fulfilled his promise. The fatted pup was killed for the wedding feast, and when Hi-Chum-Chop passed Winky-Hi the liver wing all present knew that it was a token of eternal goodwill, in accordance with Chinese custom from time immemorial. 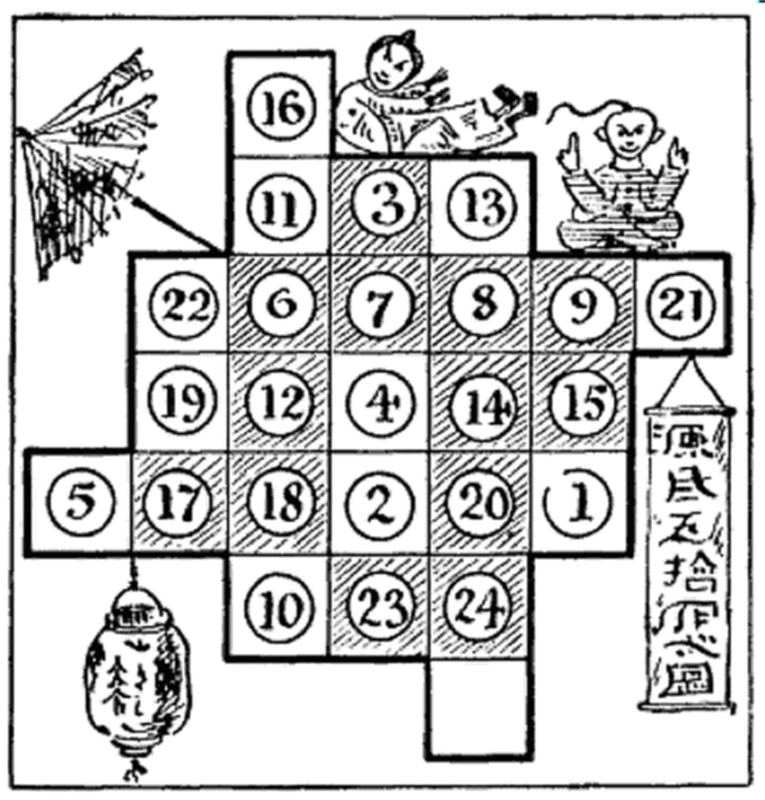 "The mandarin had a table divided into twenty-five squares, as shown in the diagram. On each of twenty-four of these squares was placed a number counter, just as I have indicated. The puzzle is to get the counters in numerical order by moving them one at a time in what we call “knight’s moves.” Counter 1 should be where 16 is, 2 where 11 is, 4 where 13 now is, and so on. It will be seen that all the counters on shaded squares are in their proper positions. Of course, two counters can never be on a square at the same time. Can you perform the feat in the fewest possible moves? Really a great supportive work.Puzzle page will really make students intelligent. This like academic related work will be a great support to reduce the students essay writing services work for schools.